Chicken Avocado Salad Roll Ups are great appetizers for a party, healthy lunch for kids or light and easy dinner for whole family just like my previous chicken avocado hit Chicken Avocado Burritos. It’s easy, make ahead recipe and freeze well. 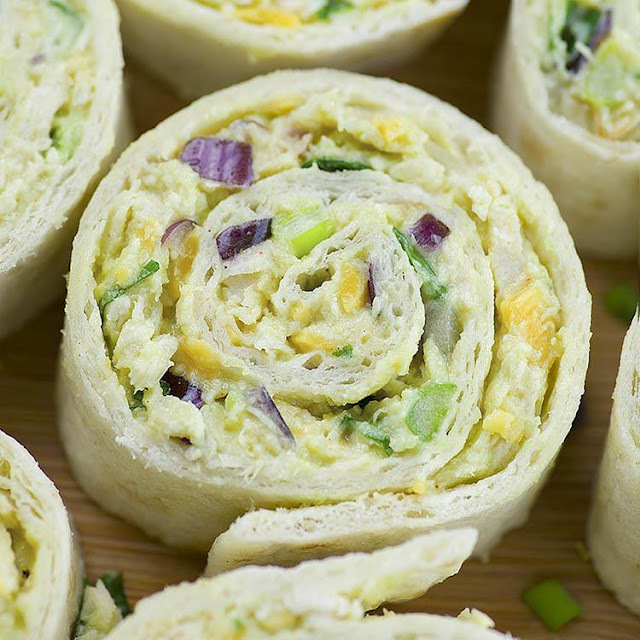 Chicken Avocado Salad Roll Ups are great appetizers for a party, healthy lunch for kids or light and easy dinner for whole family. NOTES: I had enough filling for 5 tortillas (10 inch diameter). You can use 6 (8 inch) tortillas. In a large bowl combine all ingredients for Chicken Avocado salad. Stir until evenly blended. Spread the mixture over tortilla and roll up tightly. Repeat with remaining salad. Slice with serrated knife into ½ inch slices. You can slice them immediately or refrigerate until firm (about 30 mins). It’s easier to slice when chilled. 0 Response to "Chicken Avocado Salad Roll Ups"